Here is another pretty out-of-season bloom. Calla lilies are a gorgeous sight with large cream-colored blossoms rising from clusters of dark green leaves. They usually flower from May through June, but recently there has been a pretty cluster of them growing near the neighborhood farm stand in Bolinas–is it climate change? Or just the variable microclimates in the Indian summer of California? The stark white “flower” of the calla lily is actually a spathe, or bract–a leafy appendage below the flower that is usually green. The actual flowers are clustered on a yellow nub that rises from the center of the creamy white sheath. Each spathe is nearly 10 inches across. This plant is native to east Africa, and grows in scattered locations here in California–usually near places that are (or were historically) inhabited. 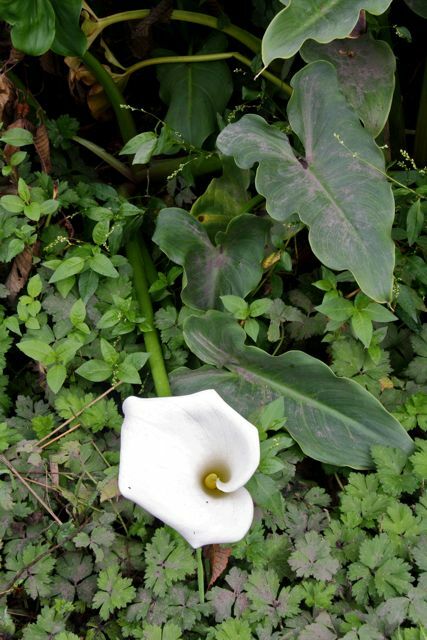 Calla lily (Zantedeschia aethicopia) is mildly toxic to eat. 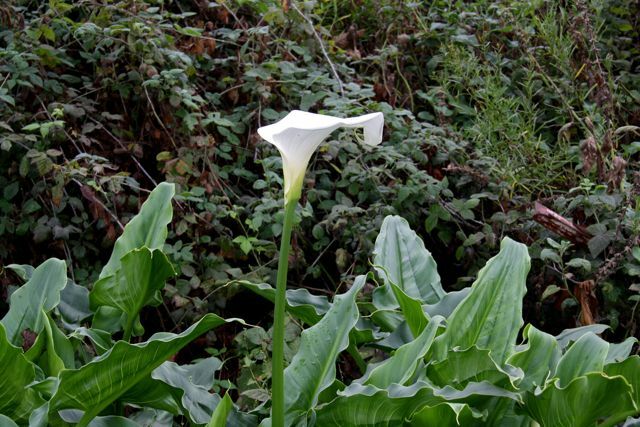 It is also called Arum lily and (according to Wikipedia) “varkoor”, which aptly means “pig’s ear” in Africaans.